In many situations, it is a good idea to create a snapshot of exactly what is on your computer screen and a number of programs are able to do it well, but Gadwin PrintScreen is an excellent tool which makes the task a piece of cake. 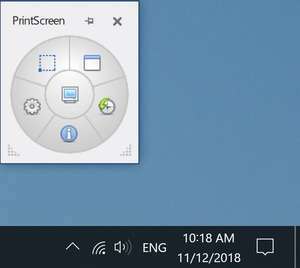 As the program name might suggest, the default hotkey for creating a screenshot is with the "Print Screen"/"PRTSCN" button. The program offers several useful options, one being a delay which can be set before creating a screenshot; it can be anything up to 1 minute, in seconds. The interface of Gadwin PrintScreen after taking a snapshot includes a menu bar at the top which includes Zoom, Pan, Fit to Window and Full Screen Preview. Version 5.8.5 is a freeware program which does not have restrictions and it's free so it doesn't cost anything. For security reasons, you should also check out the Gadwin PrintScreen download at LO4D.com which includes virus and malware tests. Additional screenshots of this application download may be available, too. Gadwin PrintScreen has a presence on social networks.